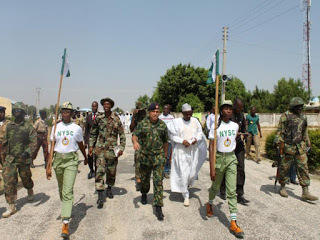 Corp members are posted to an orientation camp controlled by the military in cities far from family or friends and are expected to mix with people of other tribes, social and family backgrounds, to learn the culture of the indigenes in the place they are posted to. This action is aimed at bringing about unity in the country and to help youths appreciate other ethnic groups. So you probably received your call up letter and saw Kano as your state of deployment and you are already thinking ''My own don finish" especially if you are not familiar with the Northern parts of Nigeria. 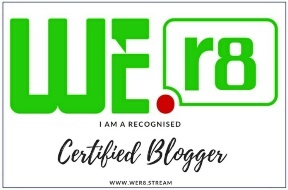 Wipe your tears my beloved, I recently concluded (Batch A stream II, 2016) my orientation camp in Kusala Dam, Karaye LGA Kano state and I am here to share with you my experience. I don't usually share this much but I needed to for the benefit of those who may find it helpful. So, let's get to the full gist if you're interested. My experience wasn't a bad one, honestly it wasn't (haha). I do tell people, this Northern thing is all about mindset - what you believe and think may happen. I schooled in the North and I have friends who were born and brought up in the north and they are enjoying it and living their life free...Yes, it's possible! The journey to the camp was something else...I don't even know how to start or express my feelings about it but I would term it - very stressful. Although I was coming from FCT, Abuja which was about 5-6 hours to Kano but it was not as stressful as compared to those who were coming from the eastern, southern and western parts of Nigeria. It doesn't end with you arriving Kano state as your place of destination, the journey is still farther than that. Because after dropping at the last bus stop, the camp is still about 2-3 hours from the main Kano town and that's because Kano is the second largest city in Nigeria with about 44 local governments sharing borders with Katsina, Jigawa, Bauchi, and Kaduna state. 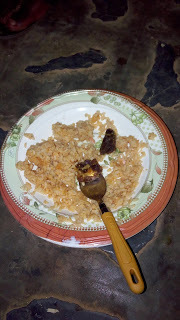 And please for your information, things are not cheap in Kano (let me draw your ear to it now so you can hold enough cash when leaving your residence), the only thing cheap there are things like bread, petty foods, and onions. And try not to pick a drop to camp especially if you are new to Kano, except someone or your parents are kind enough to take you down. But if not...please ehn...look for other prospective corp members like you (you will see them plenty in the park, just ask questions) and tag along with them. After going through a semi-thorough screening at the camp gate (they seemed very strict and unfriendly on the first day), credentials were checked just in case you lied about anything and contrabands were also confiscated. At first sight of the camp, I was surprised because I was expecting to see a local place but like seriously it was okay (at least finer than Abuja camp). The first thing we were supposed to do coming inside the camp was to register so as to obtain a bed space in the hostel, then move to the store to get a mattress. Believe me when I tell you mine was so flat like a flattened loaf of bread, some were lucky enough to change theirs but thank God for my comfy blanket. After then, I moved to the hostel I was allocated to so I can drop my mattress and luggage only for me to meet an abrupt system...the room was already filled up (girls sha!!!). Okay...let me just tell you what happened...my room and bed space was already hijacked by another female corp member who was somehow sharper than me (she wasn't nice at all). Of course I told her I was allocated to the room and that this is supposed to be my bed space and after eyeing me from head to toe, all she could say was "sister beta go look for another bed space before dey take all the fine fine rooms becos na so dem take hijack my own too". But I was later grateful to her because I later got a better room (we were about 21 in the room but it was quite big) with very nice room mates and none of my things got stolen. My first day was a bit stressful because of the long queue at the registration hall and as a result of the moving up and down wahala but thank God, I completed my registration in good time. After sleeping like around 11pm that first night hoping to wake up around 3.30pm to shower and prepare for early morning parade which was by 4pm, I was so sad to be woken up by 12.30am with different kinds of noise (sounds of bucket, laughter, footsteps, etc.) by other corp members both in my room and other rooms (I think the parade thing was shacking them up and they were so eager to see what it feels like). It was so disturbing that everyone had to wake up because we feared that soldiers may come and start pouring people water like we heard from past experiences (no soldier poured me water all through though) but it got more annoying when I had finish dressing up in my white over white (white fowl) and still had to wait like extra two hours before the alarming trumpet sounded (believe me I felt like looking for the first person who woke us all up that early morning so I can give her a very serious beating...just kidding). So the trumpet later sounded and the next thing I heard was "outside everybody" "if you are still inside you are wrong" "hey you double up there" and many exciting phrases (it was so funny). Of course it was the first day, so we found it all fun, running outside, laughing and making side comments happily (but it wasn't any more fun after 3 days...don't ask me why or what happened...you will come and see it for yourself). We jogged and doubled up to the parade ground as nobody wanted to face the consequences of disobeying the tough seeming soldiers. We stood in that parade ground for close to 4 hours and the worst thing was that we would still be back there like around 4.30pm or so (I didn't like the parade thing again after that first experience cos it wasn't easy at all but it was very interesting though). 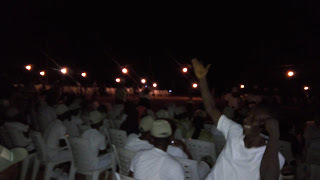 It wasn't yet dawn but corp members had already started taking pictures (if soldiers catch you sha!!!) of their activity on the parade ground (why can't they just wait until it is dawn you may ask but guess what I was part of them too...so shhhh!). The parade consisted of nice activities like morning supplications, meditations, admonitions, French lessons, exercise (Jin jin di body!!! ), left, right, pre-pre-shon, round about turn, etc. Each time I remember my platoon which was Platoon 5 and the tagline GINGER, I can't help but laugh especially about our festival/carnival day shirt (if you were in platoon 5 and in batch A2'2016, I bet you can relate). My platoon was okay though (at least we won the Oando cooking competition...yayyyyy...though it was just because of one experienced Olaoge guy who I guess knows almost everything about cooking...lol) and more fun because we had the best platoon soldier (Star boy), he was the most friendly soldier in camp and he always made us smile and he was fine too (don't think I was crushing on him oh because before you know now I will be hearing gist). 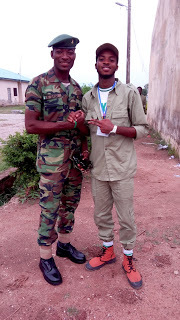 The camp soldiers were very...very friendly and lenient except for that parade commandant that was always shouting but I so much enjoyed the part where fellow corp members would imitate the words of those soldiers and the soldiers themselves will be smiling with us. Special shout out to all those in my platoon who made the whole experience more fun (Hannah, Tosin, Oyin, Margaret, Gold, Ope, Olaoge, Bessy). No vex if your name is not on the list (I couldn't remember your name that's why) and for those I mentioned (don't get it twisted). 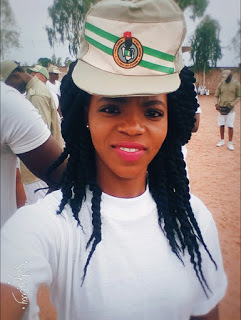 I will still shout out to all my corper friends who were not in my platoon and to those who served else where; Blessing Owoicho (Katsina corper...this girl virtually took care of me in Kano...thank God for her and her family), Benita Oyih (Abuja corper...a very good friend), Tosin (the first male friend I made in camp...very friendly and to realize he was an Abusite...that was it), Seun and Nelson (this 2 guys ehn...they made my stay in camp fun and interesting...they were also Abusites), Uba (Lol...my very good Igbo friend), Jennifer (Funke Akindele's carbon copy), Oyin (fine gal), AY, Williams (nice guys), Emmanuel (Mr. Mancho contestant), Victor (the guy with the great voice), my Red cross people, and my nice room mates. 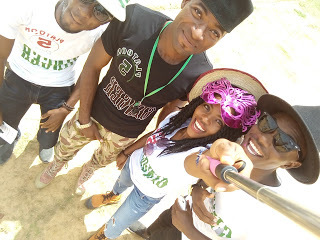 We prepared for this day like it was somebody's wedding day and that's because without them swearing us in, we would still be addressed as 'prospective corpers'. Oh my...that parade thing wasn't easy oh (they stressed the hell out of them), I was among them initially but I ran for my life (you have to pay the price of standing under the sun matching and repeatedly doing the same thing over and over again). So the day finally came and we were all advised to straighten up our beds leaving nothing hanging (like pants and towels), keep our hostels clean (they even did sanitation), and dress up in our khaki 7/7 (the khaki trouser, khaki shirt, cap, belt, 2 green and white socks, belt, and the boot making it 7 over 7). 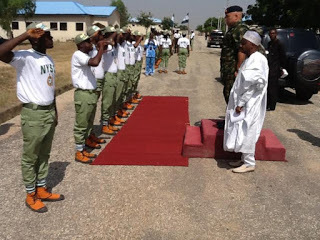 The Director General of NYSC (Brig. Gen. SZ Kazaure) was supposed to be there that day but was represented by someone else (who can remember her name? ), we also had to showcase all that we had been taught and practicing (if you mess up during the match past ehn). But honestly we didn't do the general salute thing very well especially that "remove all head dressing" but our "tanda hai" and "pre-pre-shon" was perfect. How can I forget the NYSC anthem so soon (it was like our nursery rhyme), that song gives hope especially when the band is involved (apart from the under the sun and in the rain thing), but like seriously how can we be serving our Father's land under the sun and in the rain (do they want me to fall sick?). This kits thing (khaki top, trouser, 2 white shorts, t-shirts, 1 white canvas, 1 boot, 2 pair of socks, belt, and cap) was a very serious issue. When I was given mine, I am very sure it wouldn't even size my father (Lol). Everything was so big and extra large for me (aside my small stature) except the white t-shirts, socks, belt and cap. I didn't get who to exchange with but the store changed my white canvas for me. But those Mami market tailors didn't help matters at all, they knew we would have to wear our Khaki for the swearing in ceremony, so they used that opportunity to hike the price for adjustments (it was between 1,500 - 2,000 naira). My dad really didn't find it funny when I requested for more money after 1 week. But honestly, Kano camp Mami market sells almost everything you need...even books...bought plenty books sef. Price of things were also over hyped (don't know if it was so in other camps). I am going to reserve my comments on this one because the picture says it all, but I will give you one good advice if you will listen. Do yourself some good and hold enough cash separately for feeding aside your physical cash or pocket money...there are no ATM's in the camp. I would say Kano camp wasn't really that social (though not boring) because we didn't observe most of the popular events like debate, gala night, bon fire night, and endurance trek (may be because of the environment). 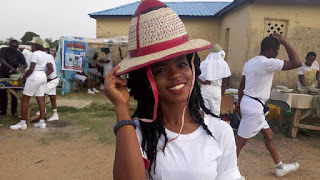 But events and things like the cooking competition, sports, man 'o' war exercise (I had body pain for days), OBS Crew (many shout outs), Red cross (my escape route), drama (I participated in it), cultural dance, comedies, Mr. Mancho, Mrs. NYSC, etc. made the camp very interesting. I didn't fully participate in most things, but some people joined almost everything, I mean everything (they were brain washed into thinking that if they fully participate and mark all the attendance...they would get good posting's...especially the parade people...Lol). All in all, it was an unforgettable experience and mine was a good one aside the stress, the hard situations I had to cope with while in camp like; the bad water, the boring lectures (many people were just sleeping), the sleeping very late and waking up beyond early thing, the operation getting slimmer and getting dark things because of the sun (the weather was too harsh that no matter the degree of your sun blocking cream the sun's effect will still tell on your skin), and the mosquitoes (don't underrate them cos they were well trained). This was a once in a lifetime opportunity and experience for me and I needed to make good use of it. And despite the many disadvantages most youth corp members still say they missed the camp life but honestly and seriously, I don't miss a thing. What about you? I deeply feel the most important thing is to get a nice PPA (Place of primary assignment) and a suitable accommodation for your stay after it all. 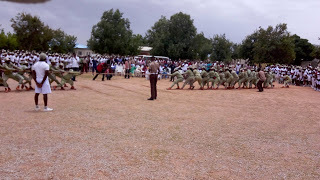 However, many corp members had planned on relocating after camp, either with fake medical reports, some with marriage certificate, and some with illegitimate claims of insecurity (Lol). It was an experience indeed! Are you a new or current youth corp member? Were you posted to Kano State? Did you find this post helpful? Kindly let me and others know below.